A new on-demand shuttle service booking app. 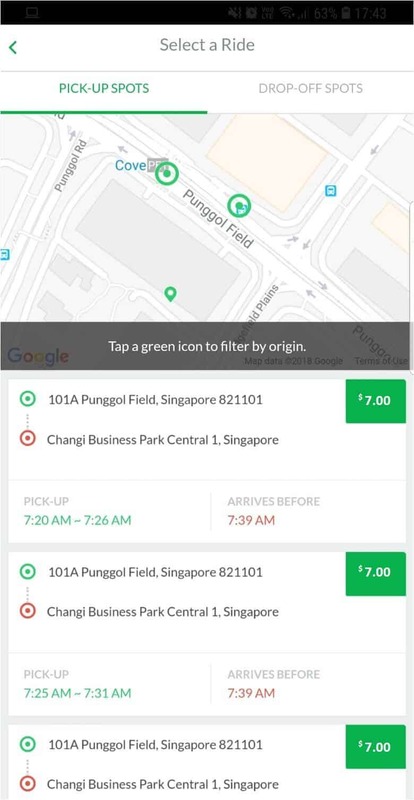 Introducing the all-new GrabShuttle Plus app, an on-demand shuttle service in Punggol, Sengkang, Serangoon, Hougang, Seletar, Bedok, Tampines, Pasir Ris and Changi. We’ve combined the best of taxi, car and bus services to offer you convenience and flexibility at a very affordable price. You no longer need to follow a scheduled bus route, simply book your personalized shuttle service directly from your phone immediately or up to 3 days in advance. Just key in where you want to go and your preferred pick-up time, and GrabShuttle Plus will help find a list of shuttles headed to your destination. Everyone gets 4 GrabShuttle Plus rides FREE. Just apply the promo code SHUTTLEPLUS at the payment screen. Download the GrabShuttle Plus app from the App Store or Google Play and try it for yourself today! You can request your ride immediately or 3 days in advance. Cut down your travel time with fewer stops and transfers. When you book a ride with GrabShuttle Plus, your seat is guaranteed. Sit down and relax! Easily track your shuttle within the app, or schedule your trip in advance to plan your week ahead. Enjoy the convenience of a on-demand ride at a lower price. Fares are as low as $2.80. Input the time and date of your trip. You can ride instantly or make a booking up to 3 days in advance. Select the number of seats you’ll need. We’ll show you the best available routes. Make your selection. Pay for your ride via credit/debit card to confirm your booking. This guarantees you a seat onboard. Make your way to the pick-up point before the pick-up timeframe. Hop on and enjoy the ride! Commutes are better made together. Refer a friend to GrabShuttle Plus and receive SGD6 worth of rides, each. Click on the link below to see how it works. Interested in partnering with Grab? GrabShuttle Plus is a new service that allows passengers to pre-book a seat on a shared vehicle. It is available via a separate GrabShuttle Plus application. What is the difference between GrabShuttle Plus, GrabShuttle and GrabShare? GrabShuttle Plus is a stop-to-stop (pasengers walk to nearby stops) service with non-fixed routes using shuttles. GrabShuttle is a fixed route service. GrabShare is a door-to-door service using cars. Do I have to download another app for GrabShuttle Plus? Yes, simply download the GrabShuttle Plus app via the Apple and Google Play stores. Where is GrabShuttle Plus operating? What days does GrabShuttle Plus operate on? Service hours are from 0600 to 2200hrs, every day including public holidays. A range of different sized vehicles (4, 6 and 13 seater) are used. All vehicles are air-conditioned. What are the pick-up and drop-off points? Generally, these are points in high-demand locations such as commercial building driveways and residential areas. 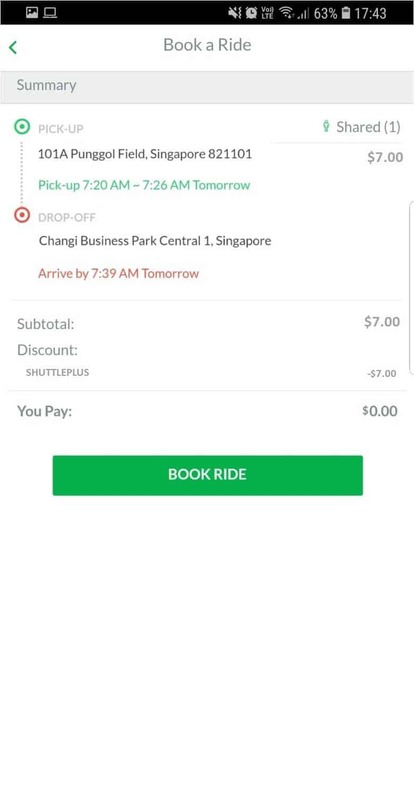 Why should I use GrabShuttle Plus? GrabShuttle Plus allows you to quickly make a booking and get an immediate confirmation, with a transparent fare structure and guaranteed seat. Trips are faster and more direct, and locations are tracked in the app. You can create bookings through the GrabShuttle Plus app. Simply enter your desired origin and destination, number of passengers and booking date/time. Choose from the options that are listed (different timings and pick-up points near you). Book a guaranteed seat to a drop-off point near your destination. Please arrive at the pick-up point 5 minutes in advance. Choose a date or time in advance. Bookings can be made on-demand up to 3 days in advance (excluding today). All rides are determined by the distance traveled starting from $2.80. Each additional passenger on the shared ride is charge $1. Payment is easy! You can pay via Singapore issued debit/credit cards when you make the booking. Bus drivers will not be able to accept cash nor EZ-Link payments on board. How do I get free rides? Refer your friends to register using your unique referral key (Find this in ‘Get Free Rides’ in the app menu. When they use the service, you get free rides! Once your payment is made, you will receive details on the confirmed booking in the section ‘My Rides’ the app. Yes, simply choose up to 5 seats. Do note that all passengers in 1 booking need to travel at the same time and get picked up and dropped off at the same stops. Cancellations are allowed but cancellation fees may apply. You will be notified when you’re next to be picked up, and you can track your bus in real time in the section “My Rides” in the GrabShuttle Plus app. What do the circled numbers on the tracking screen represent? They represent the sequence of stops the driver will make before reaching your stop. What if I would like to change my destination before boarding? Please cancel the active booking and book another ride with the new destination. Yes, communication between passenger and driver is supported. Why am I not able to see the driver details? Drivers details are visible only when the driver is enroute to your location. Each bus will have a Grab decal on the bus. The vehicle number will also be reflected in the trip details when you are the next passenger to be picked up. Simply tell the driver your name (as used in the app), get a seat and enjoy the ride. Yes, we welcome children on board. Please indicate the number of passengers (including toddler and infant) correctly when making a booking. For example – if your group consists of 2 adults, 1 toddler and 1 infant, please indicate as 4 passengers. Can I board the GrabShuttle Plus bus if I did not make a booking? Can I stand in the bus? If there is a bus breakdown, we will try and reroute you to another bus. If your trip is cancelled, you will be notified on the app and automatically refunded. Can I get GrabRewards and use my GrabCredits for GrabShuttle Plus? No, these are not supported at this point in time. Will bulky items be charged? Yes, all bulky items that require additional space will require a separate seat booked.